The migrant caravan, which has been met with threats from Donald Trump, is the result of poverty, growing crime and repression in Honduras. 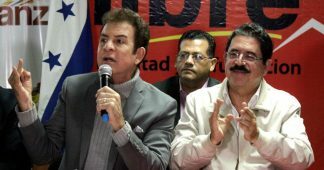 The US has played a key role in propping up the government of Juan Orlando Hernández, who was reelected in November through blatant electoral fraud. 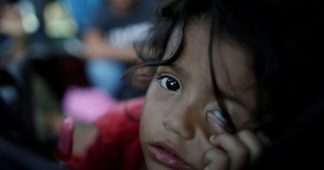 For the thousands of Hondurans who are part of a migrant caravan proceeding towards the United States, the recent comments by US president Donald Trump were yet another instance of the persecution they have faced while trying to escape horrible living conditions. On Monday, Trump threatened the countries the migrants passed through – Honduras, El Salvador, Guatemala, and Mexico – with sanctions for failing to stop them. He also called them criminals. This is in addition to the brutal repression they have faced since the beginning of their journey. Nearly 7,000 people are part of the caravan that began early last week. The reasons for their flight are diverse but most of them have to do with the absence of dignified living conditions in Honduras. People are unable to access education, health care and employment, and violence is ubiquitous. The situation has drastically worsened in the last decade with the coup d’etat, imposition of the dictatorship and the illegal reelection of Juan Orlando Hernández (JOH). Many have said that the thousands of Hondurans headed towards the United States border are not in search of the ‘American dream’ but are rather fleeing the Honduran nightmare. The hashtag #MejorMeVoy (#ItsBetterIGo) has been trending, with people highlighting the extremely adverse conditions they are facing in Honduras. The caravan has been met with an outpouring of solidarity from people across the world. In Guatemala and Mexico, many community organizations and residents who live along the caravan route rallied to organize supplies, food and general support for the thousands of Hondurans. However, the state response has been one of threats. Several US officials, as well as those from Guatemala and Honduras, have warned the migrants of repression and deportation should they reach the United States. At both the Honduran border with Guatemala and the Guatemala-Mexico border, the caravan was met with tear gas and baton attacks. Donald Trump has repeatedly threatened on Twitter to cut all aid to the three countries. He even claimed the caravan was full of “criminals” and “unknown Middle Easterners” and as such, it has been deemed a national emergency. Trump also alerted Border Patrol and threatened that he would deploy the US military to close the southern border. He even went so far as to thank Mexican law enforcement by retweeting a video of riot police being deployed to repress migrants at the Mexico-Guatemala border. 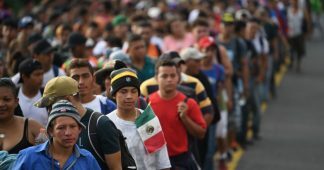 He also tried to frame the caravan as a result of Democratic party immigration policies, in an attempt to generate anti-Democratic sentiment before the midterm elections scheduled in November. What are the conditions like in Honduras? Honduras is one of the poorest countries in Latin America. More than 65% of the population lives in poverty with 40% struggling in conditions of extreme poverty. It is also the second most unequal country in the region. Since its founding, Honduras has mostly been ruled by conservative governments in service of the United States and its imperialist interests. It is home to one of the largest US military bases in Latin America, Palmerola, which has served as a strategic launch point in the region to quell dissent. For example, in the 1980s, at the peak of the left-wing guerrilla struggles in Guatemala, El Salvador and Nicaragua, many counter-insurgent forces and operations were coordinated from Honduran territory. Today, Honduras continues to be a highly militarized country. Despite the absence of any internal armed conflict, its military and military police are deployed across the country and concentrated in areas of strategic economic importance. Economically, Honduras has also been key for the empire. It has historically supplied transnational companies with land and cheap labor. For example, the US-based United Fruit Company, now Chiquita Bananas, has been operating in Honduras since the early 20th century. The company profits off the poor working conditions and low wages that they pay the Honduran workers. In response, in 1954, thousands of workers went on strike to demand better working conditions, salary and the creation of a labor code, among other demands. Since the coup d’etat in 2009, there has been a significant increase in the number of concessions given to transnational companies for mining, energy and cash crop plantations. These projects have had all sorts of diverse impact from displacement of communities to contamination of their water and the environment. In a country with very little state support and high unemployment, cutting off people’s access to clean water and the ability to work on their land has had a dire impact. These extractive mega-projects have been resisted fiercely which in turn has been met with brutal repression. 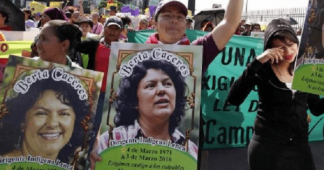 An example of this repression is the assassination of Berta Cáceres and the attack on the movement she led, the Civic Council of Popular and Indigenous Organizations of Honduras (COPINH). 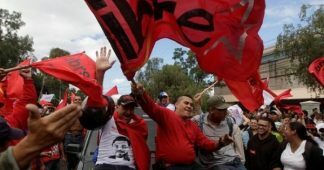 Berta and COPINH were integral to the resistance to the coup of 2009 and saw first hand how the imposition of mega projects in the territory of the indigenous Lenca community was a direct consequence of the coup d’etat. The Agua Zarca dam project, which COPINH was resisting alongside the Río Blanco community, received its concession and licenses shortly after the coup. In 2017, Global Witness declared Honduras the most dangerous country to be an environmental activist. At least 120 Honduran activists have been killed since 2010 while trying to protect their rivers, forests and land. Honduras is also infamous for high levels of crime due to the pervasiveness of the ‘maras’, which are structures of organized crime . These are controlled by top-level police and state officials who use young Hondurans as pawns to wage their war to control territory and drugs. 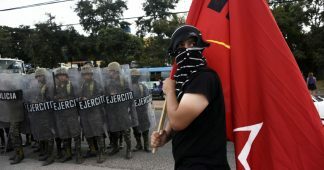 Due to the lack of opportunities in Honduras, many young people are forced to join the maras or in many cases, are even coerced into enrolling. Generally, the maras have a policy of killing those who disobey their orders or try to leave. Many of those currently fleeing Honduras are doing so for this reason. The systemic corruption, collapsing health system and underfunded public education are other key factors that make life in Honduras unsustainable for the majority of its citizens. Most of these conditions are the direct results of the policies of the overwhelmingly conservative governments of Honduras and the US ,which has significant economic, political and military influence over the country. After the 2009 coup d’etat and the destruction of democracy, these sectors further consolidated their project to sell Honduran resources to foreign companies, militarize the territory in defense of these projects of capital, and divert state resources destined for health and education into the pockets of the political elite. In the next few days, the thousands of Hondurans who are part of the caravan will continue their journey towards the US border, where they will surely be met with even greater difficulties. The plight of Honduran migrants is the most glaring example of the contradictions of US policy, which has led to the creation of horrible living conditions in many countries, yet seeks to penalize and punish those who wish to escape it. In April, a Central American Migrant Caravan, comprising over a 1,000 people, was met with similar repression and threats by Trump and US officials and were denied the chance to apply for asylum.